South Korean president Park Geun-hye, suffering from the worst rejection of a sitting president in the country's political history, has apologized for the second time this week for the abuse of power scandal that has rocked her government tis week. Federal prosecutors on Wednesday issued an arrest warrant for Park's close friend and informal advisor, Choi Soon-sil, on charges of abuse of power and attempted government fraud, and Park, South Korea's first female president, is being accused of allowing Choi to view confidential documents,presidential speeches and accumulating millions of dollars in donations to her foundations despite not holding an official government position. 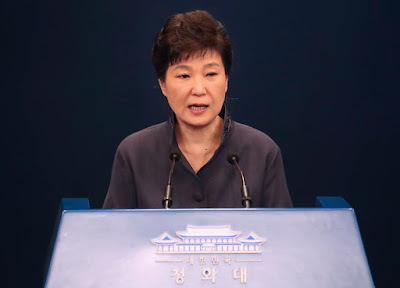 In the apology made today, Friday, Park said she'll take all responsibility for her close friend Choi Soon-sil's access to government documents and was willing to be investigated, she even denied being in a cult. "All of this happening is my fault. It happened because of my neglect," she said in an emotional televised address Friday. "I feel a huge responsibility [for the scandal] deep in my heart,"
"There are even talks of me being immersed in a cult or resorting to shamanism in the Blue House. I would like to say that this is absolutely not true," she said. "I put too much faith in a personal relationship and didn't look carefully at what was happening". "Sad thoughts trouble my sleep at night. I realise that whatever I do, it will be difficult to mend the hearts of the people, and then I feel a sense of shame and ask myself, 'Is this the reason I became president?'" Park said anyone found to have done wrong would be punished, and "if necessary, I'm determined to let prosecutors investigate me and accept an investigation by an independent counsel too". 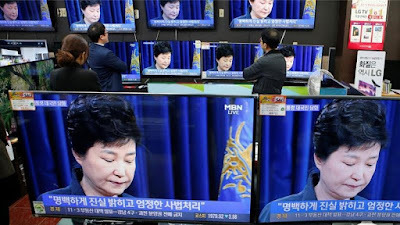 Park's rating among South Koreans is now 5%, with 89% having a negative opinion of her performance since the scandal broke out according to a new Gallup poll in South Korea.